I bought my first rhubarb of the season on Saturday from my pal, Phyllis. She was out working for a local farm that I can practically see from my office (if my office had a window). 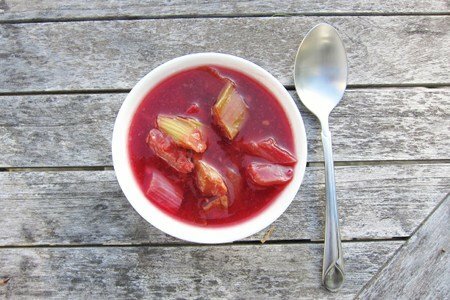 Every year, I put out a new rhubarb recipe to try to entice you to try it. This year, I found a cookbook of New England cooking for $6 at a League of Women Voters book sale. Since I live in western Massachusetts, this was a good choice to help me figure out what to do with the regional produce (pumpkins, apples, blueberries, lobster, etc.). I like this recipe because it doesn’t take a lot of time or ingredients. I had everything on hand and whipped this up before you could say "rhubarb is in season". Using a casserole dish in an oven rather than on the stove is easier for me (as long as I put on a timer) because I am frequently parenting, cleaning, and breathing all at the same time. What is your favorite way to serve rhubarb? Preheat the oven to 350 F. Wash the rhubarb and cut the ends of each stalk. Slice into 1 inch pieces along a diagonal. Spread ⅓ cup of jam on bottom of small casserole and add the rhubarb. Dot with ⅓ cup jam and sprinkle sugar on top. Cover the dish and bake without stirring for 25 minutes until rhubarb is tender. Let cool to room temperature and serve with whipped cream (if you have it). Wow, I just made rhubarb compote and, well, put it on a bit of vanilla ice cream. Yummy! I make something similar and put it on my plain Greek Yogurt. This looks good and not alot of sugar as most recipes I see using rhubarb. It's perfect for rhubarb crumble (albeit that makes it a little more indulgent). You can make a healthier crumble topping by including oats and/or shredded coconut, and chopped nuts like macadamia nuts. You can even make a big batch of crumble topping in advance and freeze it, and take out what you need as and when. Just put it on top of the dish as outlined above, and bake. I was wondering how the dish gets it liquid as shown in the pic? Does rhubarb really have that much moisture to give out during cooking? @Shari - yes, it does. I kept it covered the whole time so all the liquid remained in the casserole. It is kinda like celery - lots of water. Thanks for your question! I've never liked rhubarb but this actually sounds good. My grocery list just got a bit longer! I'll get back to you! I just slice some rhubarb and fresh strawberries up, equal mixtures of both, and then simmer it on the stove. I don't add any water. When it has cooked down I stir in 1 tablespoon of brown sugar. The strawberries provide natural sweetening for the most part. It is wonderful on top of some nonfat plain Greek yogurt! Does the rhubarb need the sugar from the jam or would it work with Simply Fruit or sugar-free preserves? Looks great! I make rhubarb squares once each srping in honor of my grandmother. She used to make them with rhubarb fresh from her garden. Rhubarb squares are basically a sourcream cake with rhubarb mixed in, topped with a crumble mixture. Love it! Thank you for 3 more Rhubarb recipes. Look forward to trying them out when locally grown rhubarb is available; say in another 3 weeks. It is still cool here in Ontario, Canada. 2 Pkgs Sugar Free Jell-O (Strawberry or Raspberry, or both) cooked according to package directions, but with half the water called for in the recipe. 2. Add rhubarb (and cooking water) to the Jell-O. Stir and pour into a mold, bowl, pie plate, etc. Zero PointsPlus without the topping. Variation: Add fresh strawberries or cut-up peaches when pouring into the mold. Here in the Uk I have a huge patch of Rhubarb and never know what to do with it so these recipes are great! With the compote can you make a batch and freeze it to use when needed? Also please can we have a skinny rhubarb fool recipe if such a thing can be made?